Run a manual ad hoc repair operation on tables in a keyspace. 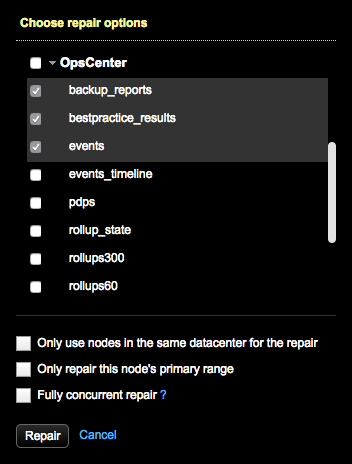 Use the Repair option in the Nodes Administration area of OpsCenter Monitoring. For more information about manual repairs, see the corresponding nodetool repair command. If OpsCenter role-based security is enabled, be sure that the permission for the Repair option in Node Operations is enabled for the appropriate user roles. In the List view, select a node. Click Repair from the main actions bar. 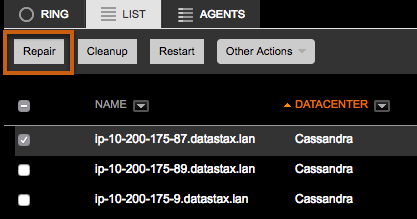 Tip: The Repair option is also available from the Actions menu in the Node Details dialog. The Choose Repair Options dialog appears. Required: Select one or more or all tables within a keyspace. Click the keyspace name to select all its tables. Manual repairs can only be performed on a single keyspace per operation. Optional: If applicable to your environment, select Only use nodes in the same datacenter for the repair. This option is analogous to using the -local, --in-local-dc option for nodetool repair. Otherwise, nodes in other datacenters within a multi-DC environment are used in the repair as appropriate. Optional: If applicable, select Only repair this node's primary range. This option is analogous to using the -pr, --partitioner-range option of nodetool repair. Optional: To run the repair simultaneously on all replicas for the node's range, select Fully concurrent repair. This option is analogous to using the -full, --full option of nodetool repair. Note: Only select the fully concurrent option if using SSDs (solid-state drives) or do not have concerns with heavy disk I/O. The Run Repair? dialog appears and warns that the repair operation might have a significant impact on system performance. A message in the top banner indicates the operation is in progress. Click the Show Details link to view the progress in the Activities page General tab. The banner message indicates when the operation is done.